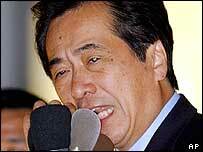 The leader of Japan's opposition Democratic Party has resigned after being caught up in a pension scandal. Naoto Kan was one of at least eight leading politicians who failed to make payments into the state pension scheme, which the government wants to reform. 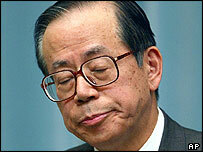 His resignation follows that of top government spokesman Yasuo Fukuda, who quit over the scandal on Friday. The admissions are a huge embarrassment for both the government and opposition, ahead of July's Upper House elections. The scandal broke last month, when seven cabinet ministers admitted they failed to make the compulsory payments into the national pensions scheme. Mr Kan later joined their number, admitting that he failed to make some payments while he was health and welfare minister in the 1990s. In his resignation speech on Monday, he said his behaviour had increased mistrust and, as he put it, created huge headaches for the public and members of his party. "To take responsibility, I will resign as head of the party," he said. He had initially resisted calls to quit, but pressure on him increased over the weekend after the resignation of top government spokesman Yasuo Fukuda on Friday. There was no immediate indication who would take over from Mr Kan. But Japanese media reports point to his number two, Ichiro Ozawa, as well as the party's secretary general, Katsuya Okada, as obvious frontrunners. The effect of a change in the Democratic Party leadership is as yet unclear, but it is certain to influence voters in the Upper House elections next month. Mr Fukuda's resignation is also likely to have an effect. His decision to quit is a major personal loss to Mr Koizumi. Mr Fukuda was the government's chief spokesman, and a key ally and adviser to the prime minister for the past three years. Not enough seats are being contested to threaten the government's majority in July's elections, but a poor showing could nevertheless be damaging for Mr Koizumi. Whatever the election result, the scandal is likely to hinder the government's plan to reform the pension scheme, raising contributions every year to 2017 while reducing benefits. The government is already struggling to maintain public confidence in the system. There are an increasing numbers of pensioners in Japan, and many people are afraid that paying into a pension scheme will not afford them full benefits when they retire, because there are relatively few young people to contribute. The BBC's correspondent in Tokyo, Jonathan Head, says the fact that so many politicians have not kept up their contributions will make it all the more difficult for the government to push through the reforms needed to keep the pension scheme afloat. Most Japanese employees have their contributions deducted automatically from their salaries, but politicians, students and the newly unemployed must make the payments themselves. Either deliberately or by accident, about 40% of the 18 million self-employed people and students aged 20 or older did not pay the obligatory contributions for the National Pension System in fiscal 2002, according to the social insurance agency.